The Newsletter Spring 2018 is now available. The Newsletter Spring 2017 is now available. The Newsletter September 2016 is now available. The Newsletter Spring 2016 is now available. The Newsletter September 2015 is now available. The Newsletter April 2015 is now available. Details of the Annual Report 2014. Details of the Minutes of 2014 AGM. The AGM of Friends of Hob Moor will take place at 7:30pm Wednesday October 8th. Before the formal business there will be a talk by Derek Utley on “Treemendous and Woodland Trust”. Afterwards, there will be refreshments and the opportunity to chat to members of the committee and other Friends of Hob Moor. If you’re not a member of the Friends, you can come and join on the night and help support the conservation of the moor. Meeting starts at 7:30pm at West Thorpe Methodist church. West Thorpe is off Thanet Road, more or less opposite the site of the former Turf Tavern. Parking is available. The Newsletter 2014 Sep – No 33 is now available. Close shave with hot air balloon on Hob Moor! This balloon (presumably from the Knavesmire launch site) looked as if it was going to make an emergency landing on the Moor, but after hovering close to the ground for about 5 minutes it took off again into the ether. Thanks to member Madeline Evans who was hovering at 8:30am on 11 September to take these photos. The conditions on our 30 August bat walk were perfect for bringing out various pipistrelles to be tracked with the bat locators. Thanks to Clair Merrifield for leading the walk, and to Nick Ansell for the photos. Friends of Hob Moor will have a gazebo at the Foxwood Park Country Fair, this Saturday (7 June) 1pm to 4pm. Come and say hello to us, and support this event at Foxwood Park off Bellhouse Way, YO24 3HY (free entry). We’ll have information about the Moor, and aerial photos and photocards to buy. The Fair will have fun for all the family, including train rides, a raffle, stalls and a scarecrow competition, facepainting, flying owls and birds of prey. The Newsletter 2014 Apr – No 32 is now available. Please come to our Winter Solstice Party. The Newsletter 2013 Sept – No 31 is now available. Details of the AGM 2013 Minutes. 25 May: Winners of the first Friends’ photography competition, with the theme “Spring on Hob Moor”, were announced at the Fair. They were judged by York-based photographer Simon Palmour, and a popular ballot was also held at the Fair – 110 votes were cast. Click here to see the winners and runners-up. HELP WANTED! As you may know, budget cuts mean that Hob Moor Fair on Saturday 25 May will be the last one funded by York City Council. The Council is prepared to give advice to teams who want to carry on organising the fairs themselves. If you’re interested in being part of this team for next year’s event please come to our stall on Saturday or fill in a contact form on this site. Let us know if you think it’s worth trying to carry on and if you could give us practical support, either beforehand (eg admin, liaising with stallholders etc) or helping on the day. We haven’t yet taken a decision on whether we could organise next year’s fair on our own, and it partly depends on how many people are prepared to help us with what would be a large and challenging task. 19 April: **NEWSFLASH**! Still spaces left on the FREE photography workshop on Monday 22 April at 6:30 pm – see events page. Emailmichael.rothwell@york.gov.uk if interested. There is now a Facebook page for Friends of Hob Moor! Our Newsletter 2013 Apr – No 30 is now available. Got a camera or a mobile phone with a camera? Read about our first ever photography competition here. Free to enter with categories for adults and under-16s. Free basic photography session on Monday 22 April at 6:30 pm – see events page. 1 April: Despite a bitterly cold wind, at least one summer visitor has braved it to our parts. A chiff chaff (or possibly a willow warbler; the two birds are so similar they are very difficult to tell apart unless heard singing) was spied in the hedgerow by the beck near the Railway Institute playing fields. And conditions are still so wet that a pair of mallards have adopted a temporary (we hope!) “pond” on the west side of the Moor near Hob Moor school. Details of the AGM 2012 Minutes are now available. Our Newsletter 2012 Sept – No 29 is now available. Marston Moor Internal Drainage Board, which is responsible for the flow of water in the Green Lane beck, is currently implementing a programme to ensure that the water flows freely and that flooding is prevented. This involves dredging the beck and removing accumulated silt and rubbish. They are not allowed to take the silt away from the area so this is being dumped on the banks or on the Moor as close to the fence as possible, then when it has dried out the litter in it will be removed. Although it will look a mess for a while, it will soon grass over and the wild flowers will go through again on the banks. At some point the pile that has been left near the gate by the Green Lane entrance will be flattened and this too will soon grass over. It is because of this work that the banks have been mown; usually this would not happen until the end of August. Trees overhanging the beck have been cut back along the path at the Green Lane entrance, all the shrubs and vegetation have been removed and the area between the path and the bank of the beck flattened and sown with grass seed. While this is happening there is a digger parked on the edge of the north side of the Moor. Our exciting new events for 2012 have now been published. See here. Our new Newsletter 2012 April – No 28 is now available. 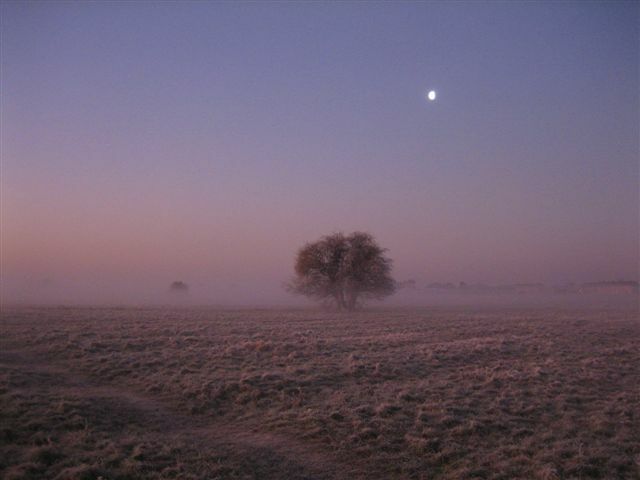 After some mild weather in early January, frost and mist have returned to the moor. One of the most magical times to walk on the moor is as the sun is rising, when the light and colours change minute by minute. The frost and the low sun at dawn pick out the contours of the ridge and furrow, and wisps of mist vanish as quickly as they appeared. Some more photos can be found here.